Why did you choose those? 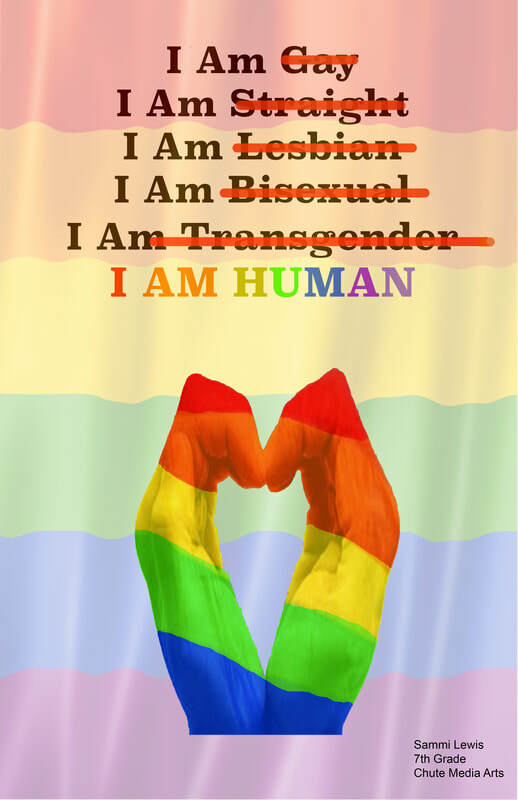 to show how the LGBTQ community shows love and how all people should show love all the time. ​Describe choices you made with text, color, font, and contrast. I used bold text to make the layers pop. I also went over the rainbow in brighter colors. How did you make each part stand out? I made some of the layers more see through to make all of them pop. Why is it an important message for us here at Chute? this is an important message for not just chute but for everyone because this is a world full of to nonacceptance and sometimes people need tone reminded to accept all. 3. Describe the choices you made with positive and negative shapes/spaces. Which are the positive shapes? Which are the negative shapes? How did you decides which parts would be positive or negative? I chose to make most of my design to be carved out so that the women symbol would pop.